I lived through jihad; here's what it was like. 10:45 a.m. a Muslim Brotherhood spokesperson made an announcement stating that all Muslim Brotherhood and supporters must go out and destroy churches and begin the Jihad. 11:00 a.m. Police announced that they have closed the bridges that connect to Cairo to prevent terrorists from entering the city. Live TV news is showing a police van on one of the bridges, filled with police, being pushed off the bridge by a mob of Muslim Brotherhood. Units of Brotherhood militias have shut down several locations of the Ring Road, a highway that circles Cairo. 11:35 a.m.: It was announced that at least five police have been killed in attacks on police stations, many more police have been injured. Christians and churches are now beginning to be attacked throughout all of Egypt. 12:00 p.m.: TV announcements are saying to stay inside your homes, so police can tell who is who. Everyone is obeying. Those who have friends or family who are out and about are told to call or text and tell them to come home or go inside some safe place and stay there. 12:20 p.m.: Photos and videos are coming in from media, and also from civilians, showing that the Muslim Brotherhood are extremely well-armed, similar to a military, and that they are arriving in large units. All of the Muslim Brotherhood units have machine guns and military rifles. 1:15 p.m.: Police in combat with some of these Brotherhood militia units have had to retreat to re-organize. The Brotherhood is coming out in large, extremely well-armed groups at strategic locations, sometimes quite unexpectedly. 1:30 p.m.: The military just released an aerial view with a very clear video of what is happening. The Brotherhood are well-armed and attacking like an army. 1:45 p.m.: At least 12 police stations have been attacked. 2:30 p.m.: Muslim Brotherhood are targeting Christians in Luxor. They have torched Christian shops and also the historical Horus Hotel (owned by a Christian). The Horus has been burned to the ground—totally destroyed in a well-executed arson attack. 3:00 p.m.: Muslim Brotherhood snipers continue to shoot from strategic rooftops throughout Cairo. Churches throughout Egypt continue to be attacked and burned. The Virgin Mary (historical) church in Minya dated in the 300s AD has been totally destroyed. 3:45 p.m.: A police station was overtaken by Brotherhood units in Beni Suef. 4:15 p.m.: Christians and churches are being attacked throughout Minya governorate. 4:30 p.m.: The famous library in Alexandria has been attacked. 4:32 p.m.: The army announced it has been officially deployed to help police. The army was filming via helicopters and monitoring everything, but had not participated in any of the operations up until this point. It has become obvious that the police cannot handle all of these attacks by themselves, especially since police stations are being simultaneously attacked. 4:40 p.m.: Nuns in Assuit barely escaped death at the hands of Muslim Brotherhood. They somehow made it to the roof of a church while it was burning and in complete flames. 29 churches have been attacked and torched. At least 58 more churches have been torched and ransacked today. There was a horrible attack on a police station in Kerdassa, where Brotherhood members stormed the police station and killed 11 policemen. Some of the policemen were disemboweled while alive. The Brotherhood filmed the disemboweling and posted it on YouTube. Some of the bodies were mutilated and their body parts removed. Yesterday, 24 police stations were attacked, and 146 policemen died in those attacks. 65 people were killed in Minya today. 10 of the dead were policemen, 5 were army soldiers, 1 was a police captain, 4 were central security personnel. Police at Rabaa mosque have found a large mass grave inside the mosque where the Brotherhood conducted a shoot out. There was a torture chamber set up inside the mosque. After people died from torture, the Brotherhood tossed the dead bodies in a pit they had dug inside the mosque. Muslim Brotherhood in pickup trucks are driving on my street firing machine guns. Churches, convents and Christians continue to be targeted. Police stations continue to be attacked and when police try to defend themselves, they are outnumbered and killed. 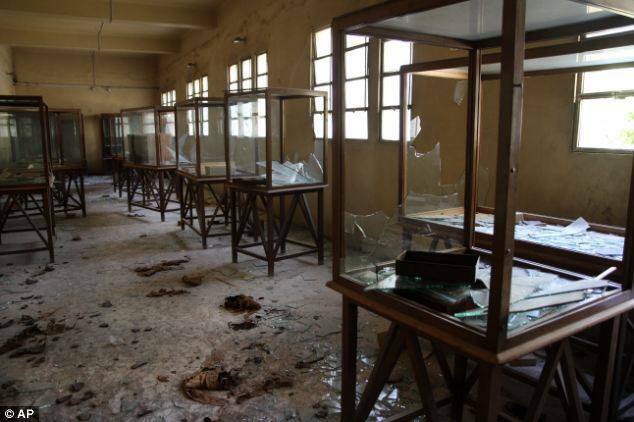 A museum in Minya was destroyed. 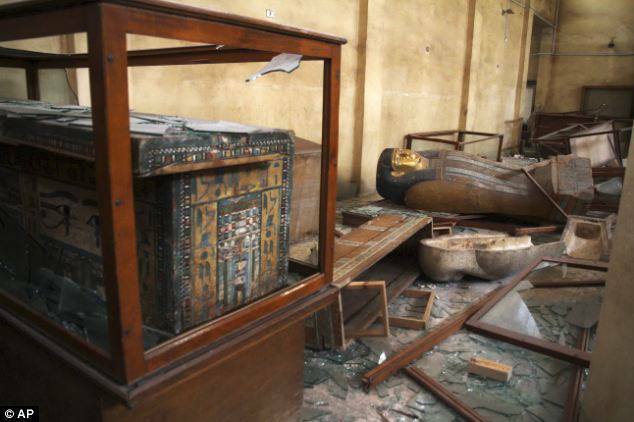 The museum’s ancient artifacts that were made of gold, silver and precious stones were all stolen first, then everything else was smashed and destroyed. The Brotherhood said the items were "idolatry." A church in Mallawi was also destroyed. This church marked where Mary, Joseph and baby Jesus crossed the Nile and is where annual Christian ceremonies depicting the crossing have taken place every year for centuries. A church and its school in Beni Suef was attacked by a mob of Muslim Brotherhood. They broke into the school, broke the windows and tore down the walls. They broke off the crosses that were on top of the buildings. The attackers then destroyed the ancient church and its buildings. In Minya, a Catholic school was burned to the ground and a Christian orphanage was also destroyed. 65 Christians were killed. On one of the main streets that has many shops and stores of all kinds, the Brotherhood painted black X’s on Christian shops. Every one of those Christian shops were then destroyed. Many cities throughout Egypt had this happen, Christian shops and homes were marked with black X’s to depict which ones to destroy. In Faiyoum, Muslim mobs looted and then torched five churches. The Egyptian Council of Churches made an official statement today. In it they said they are disturbed and in a quandary regarding the deliberate misinformation campaigns by the West. More than 80 churches have been torched. Around 40 of them have been damaged beyond repair, and many of those destroyed were ancient and historical. So far, I have not seen anything in Western media on this massive number of attacks on churches and Christians these last four days. There are Western reporters here. They know exactly what is going on. Why is this not being reported? The above was taken directly from my daily journal August 2013.